Donald Lineback and his latest E-Mail. For Sea-Kite.com the number one incentive was to build a highly efficient motor and use less energy. It has been easy for some motor designers to make high kW demanding motors. The problem – airplanes just couldn’t carry enough batteries. Big motors also disqualify themselves to be used with solar and other power supplies like fuel cells. What is the best battery and what on the “drawing board?” As for the future – higher energy batteries can be made, but they are only good for 3 or 4 charges and need to be scraped. The batteries that Tesla has been using, sourced from Panasonic, for its Model S electric cars are mostly likely a lithium-ion battery with a cathode that is a combination of a lithium, nickel, cobalt, aluminum oxide. The battery industry calls this an “NCA battery” and they’ve been around – and made by Panasonic, LG and Samsung – for many years. Typically, lithium-ion NCA batteries use a combination of 80% nickel, 15% cobalt and 5% aluminum. (The anodes in these traditional lithium-ion batteries is usually a graphite combination, which acts as a host for the lithium ions.) The addition of the aluminum to the NCA battery makes it more stable. For a home battery grid – Musk said that Tesla will use a lithium-ion battery with a nickel, manganese, cobalt oxide cathode called an NMC (or NCM) battery. Many traditional NMC batteries use one-third equal parts nickel, manganese, and cobalt. Where do we stand among all the choices? NCM still reigns as king for safety and it works great for cars that handle the slight increase in weight. We have found a new source for the NCA which offers the weight savings needed in aviation. As soon as we have all the numbers – they will be posted on our website. Our new motor has an advantage because with a slower charge time, lower discharge demand and our new Active BMS – the safety went way up. Note: 1kW = 1000W. To find Ampere hours – Watt hours ÷ Voltage. kWh (1000Wh) is unit to measure total energy stored in battery and it can be calculated as battery voltage multiplied by Ah (V*A*h = Wh). In general kWh is unit to measure energy used. Voltage is similar to water pressure like the height of the dam or water tank. Current is the flow-rate of water. A battery rated for 100 amp hours will provide 5 amps for 20 hours. If we have a 12 volt battery, we multiply 100 by 12 and determine that the battery will provide 1200 watt hours. To apply the metric ‘kilo’ prefix, we divide the result by 1000 and determine that the battery can supply the 1.2 KW hours. In the case of our 1200 Watt Hour conversion, we need to understand that what is really being said is that the battery will provide 60 Watt Hours for 20 Hours. More information from Donald Lineback on his battery systems he has been developing. “We can test 14 cells or 22 cells in one pack or add another to make a 36 cell with 150v. We can test DC or the better choice – AC sinusoidal. We supply various controllers and provide programing and wiring for BMS or PCM protection. We offer various throttles and fuel gauges. Our new motor and variable pitch prop will be available soon. 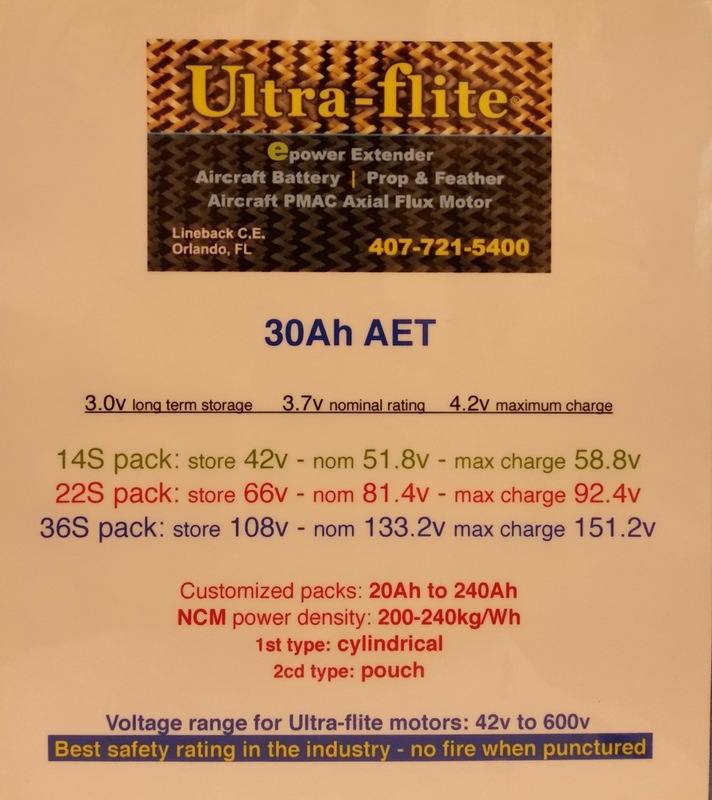 The battery pack sizes range from 30Ah to 180Ah in cylindrical and pouch. I received this email from Donald Linback. I have corresponded with Donald over the years and he is an avid promoter of electric flight, and has been working in a large segment of electric flight power systems including development of his own motor. 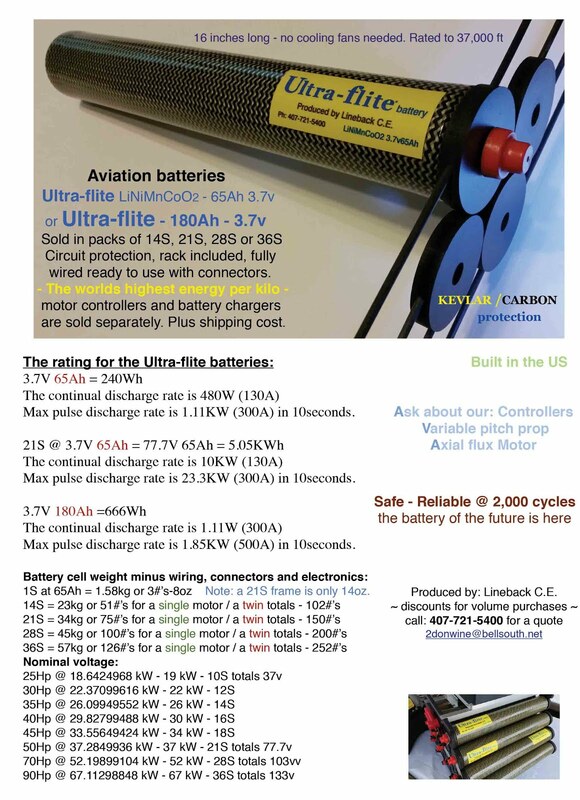 He sent this new PDF file promoting his new aviation batteries.